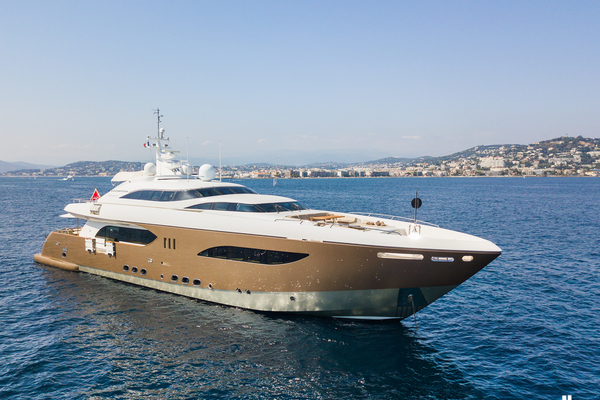 “MOTORYACHT W” offers total elegance! Her interior features a flat-panel Mahogany in a satin finish, with high-gloss accents. Her modern interior offers a warm and comfortable atmosphere. From the Salon to the Skylounge, the layout offers any options of unique areas to entertain. Her decks are also great spaces; the Upper Deck is clearly the "penthouse" for dinner or to host parties, the perfect spot to end your evening, in the hot tub under the stars! United Yacht Sales New Jersey would love to guide you through a personal showing of this 130' Westport Tri-deck Motoryacht 2013. This yacht for sale is located in Fort Lauderdale, Florida and priced at $17,495,000. For a showing please contact us by filling out the form on this page and we will get back to you shortly! second DGPS. Output to Autopilot is provided. Chart coverage from Seattle, Washington to Ft.
(2) Furuno DGPS receivers with WAAS. VHF: (2) Furuno FM8900S with DSC in Pilothouse with Emergency battery back-up. Boarding Stair: (1) 8-step Carbon Fiber with handrails on both sides, brackets at port and starboard boarding gates, stowed in a recess on the starboard house side Boat Hook: (1) 1 ½‖ X 8’ with hook end Dive Compressor: Brownies YP 45 Covers: Sunbrella padded covers for tables and loose deck furniture Spare Parts: DDC/MTU spare parts kit Northern Lights spare parts kit Sea Recovery spare parts kit Ship spare parts kit, including screws, bolts, hose, clamps, light bulbs, etc.